If your clients' have a capital loss they are carrying forward, you can easily enter the amount of the loss into TOTAL Planning Suite. Golden Years will first use any capital losses to offset capital gains, then allow the allowable $3,000 capital loss to be deducted against ordinary income per year, and lastly, carry any remaining capital loss forward. 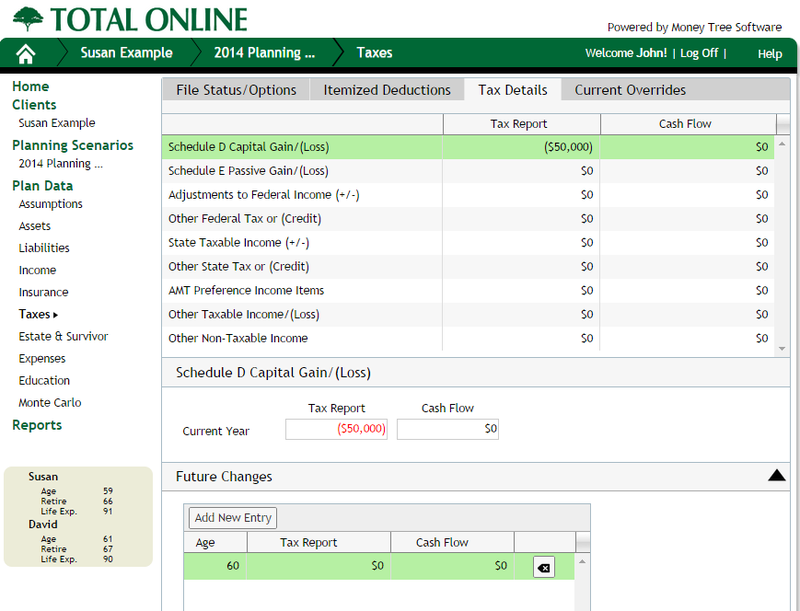 To enter a capital loss carry forward, go to the Taxes section, and the Tax Details tab. Select Schedule D Capital Gain/(Loss). Enter the loss as a negative amount under the "Tax Report" column in the Current Year inputs. Then go to the future change table below, and enter Individual 1's age next year with 0's under the dollar amount columns. The program will handle everything from there. That's all you need to do. If you would like to review the details to see how this flows on the report, keep reading. This requires tracking between report pages broken down below. To view the loss carryfoward, run the Golden Years report. The Capital Gain/Loss Carry-Forward (C6a) shows the loss carried forward. Here you will see the full loss entered under column 4, the net loss under column 5, the allowable loss amount in column 6, and the amount carried forward in column 7. In this example, we can see the manually entered loss of $50,000 in column 4. The net loss of $47,408 in column 5 is the $50,000 loss offset by the current year capital gains of $2,592. To see the $2,592 current year capital gains amount, go to the Dividend, Capital Gain Sources report (D7a) . The taxable loss for the year is the maximum allowable loss of $3,000 in column 6. And last, the remaining portion loss is carried forward of $44,408. ($50,000 loss less current year gains of $2,592 less allowable $3,000 loss = $44,408). The Taxable Capital Gain (loss) column 6 will flow through to the Taxable Income Analysis report (D7), column 2. The loss from column 6 of the Capital Gain/Loss Carry-Forward report (C6a) will be summed together with the interest and dividends that are calculated on the Dividend, Capital Gain Sources report (D7a). For this example, the $1,108 total interest, dividend and capital gain reported on column 2 of the Taxable Income Analysis report (D7) can be broken down in more detail by reviewing the Dividend, Capital Gain Sources report (D7a). On the Dividend, Capital Gain Sources report (D7a), we can see total interest of $1,482 and dividends of $2,626, less the total capital loss from the current year of ($3,000), giving us net interest, dividends and capital gains of $1,108 reported on the Taxable Income Analysis report (D7).